Everything passes, everything changes. The objects I idolised as a boy are now museum pieces and the heroes I worshipped are gone but, the obsessions remain. I am old enough to look at these machines and remember their day of revolution; the days they rolled off the transporter ramps into a world aghast at their modernity. I am old enough to remember the consequences of their frailties. – an object surviving from an earlier time, especially one of historical interest. – a part of a deceased holy person’s body or belongings kept as an object of reverence. Maybe in some distant place, everything is already, quietly, lost. Or at least there exists a silent place where everything can disappear, melding together in a single, overlapping figure. And as we live our lives we discover – drawing towards us the thin threads attached to each – what has been lost. Jim Clark’s 1967 Dutch GP winning Lotus 49 – Classic Team Lotus, Hethel. Lotus 25 – Classic Team Lotus, Hethel. This seems such a bad idea that it is hard to believe the proposal has gained any traction. It has echoes of Trump’s infamous Aberdeenshire golf course. According to The Herald newspaper, ‘Plans to build a visitor centre overlooking the old Military Road at the rest and Be Thankful, have received the backing of motorsport legend, Sir Jackie Stewart … The proposed Rest and Be Thankful Heritage Project would celebrate the road’s link to Scotland’s rich motoring history. The centre is planned to include a cafe and arts spaces within a contemporary building. I have had a lifelong passion for the motor racing of the 1950s, 60s and 70s having witnessed many of the great drivers of the period in action, not least Sir Jackie – they have my undying admiration. Equally I have a passion for the wild places of Scotland. By all means celebrate Scotland’s rich motoring history but surely not at the expense of the glorious unspoiled Glencroe. No matter how sympathetic the architecture, this is a commercial venture in a wholly inappropriate place. 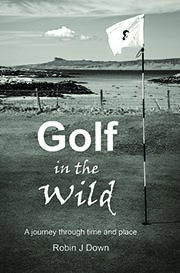 While researching Golf in the Wild I made several trips to Inveraray via Glencroe and on every occasion I stopped at the summit of Rest And Be Thankful to admire the fine view down the glen and imagine the magnificent men in their racing machines ascending the old road. Some acknowledgement of recent history would be welcome, an information board or even a replica of the Race Control shed at the summit – if I remember correctly, the foundations still exist. The rest of Rest’s story can be told elsewhere. Be Thankful. The road has its origins in the Jacobite uprisings when General George Wade recommended establishment of military bases interconnected by Highland roads such that troops could be moved quickly and conveniently between locations to quell any local uprisings. The General’s Inspector of Roads, Major Caulfield, first surveyed the route in 1743 and by 1748 the road over the Glen Croe summit was completed by troops from the 24th Regiment who erected a stone seat with the legend ‘Rest And Be Thankful’. The remainder of the road down to Loch Fyne was completed in 1749. The modern day A83 eventually replaced the original single track highway at the end of the 1930s and as you drive along the south western flank of Ben Arthur, stretches of the original route can be seen below on the floor of the Glen. Whilst the modern version ascends gradually by cutting a route along the mountainside, the original delays the steep ascent to the last. This had glorious consequences. In 1949 the Royal Scottish Automobile Club (RSAC) used the final one mile ascent of the Wade-Caulfield route to establish the magnificent Rest And Be Thankful hillclimb, an event which continued almost uninterrupted for another twenty years. Jackie Stewart describes this place as ‘the cradle of my life in motor racing’ (Winning is Not Enough, the autobiography 2007), first as a spectator, watching his elder brother Jim compete in his Healey Silverstone and later, in July 1961, as a competitor in a Ford powered Marcos. Stewart has fond memories of these times, ‘the public address announcer shouting out the names of the drivers and their cars and all their split times and his voice would echo down the Glen and I used to sit there wide-eyed enjoying a spectacle as thrilling and exhilarating as any young boy could imagine, hardly daring to blink’; and so in the shadow of Ben Arthur began the drive to fame, fortune and the career-long dance with death and tragedy. From the A83, the old road looks innocuous but in that last mile it rises over 400 feet creating a hill climb as challenging as any in Europe. Archive newsreel from the 1950 event projects a diverse array of machinery, mostly pre-war and pre-conformity, the only design constraints being the imagination. Dennis Poore in the monstrous flying Pegasus bi-wheeled 4.5 litre Alfa 8C-35, Raymond Mays and Ken Wharton in ERAs and Basil Davenport in the skinny GN Spider, all forward and trust in the Lord, a seriously strange but effective device dating from the early 1920s where the driver appears to sit astride the car in homage to its cyclecar origins. All arms and elbows, they attack Stonebridge, Cobblers and the Hairpin with true grit, determination – and no protection. Charterhall and from that moment their lives were intertwined, until that fateful day at Hockenheim on 7th April 1968. This final image shows the hairpin prior to resurfacing in April 2012. Many thanks to Maurice1948 on Blip for highlighting the story from The Herald.